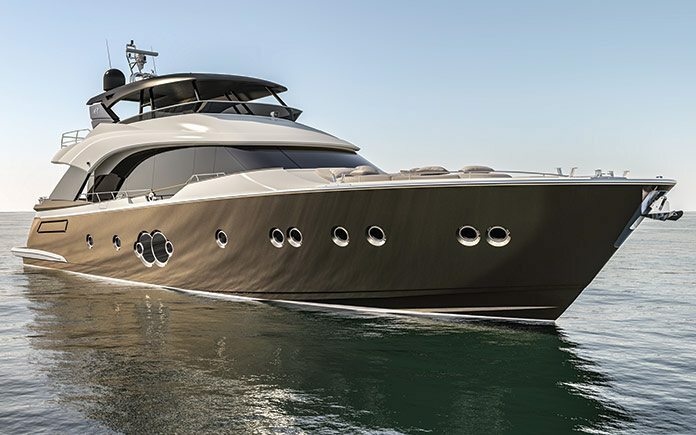 Monte Carlo Yachts will present the new MCY 80 to the public at the Cannes Yachting Festival (6-11 September, 2016) following an exclusive preview for clients and the press in July. The new model, the sixth yacht in the collection, positions itself ideally between the award winning MCY 76 and MCY 86, and continues in Monte Carlo Yachts’ tradition of combining visionary design with concrete results. 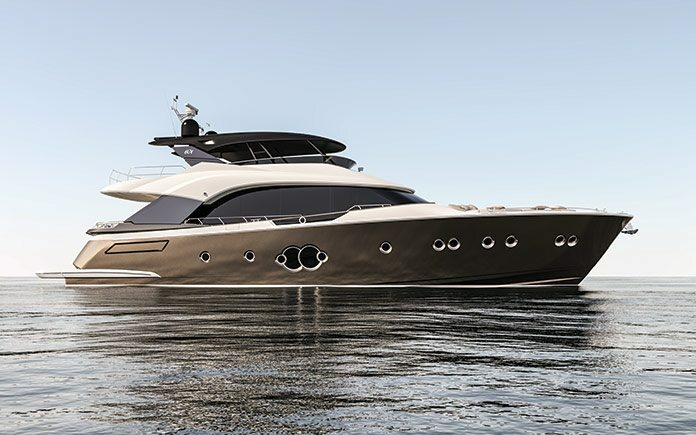 When first tasked with designing the new MCY 80, the team at Nuvolari Lenard and Monte Carlo Yachts were faced with more than just creating a new yacht. The challenge was to elevate the very concept of the yacht to powerful and refined new heights. Style becomes love for beauty, not bridled by limited standards but open to continuous evolution to create boats that join the best of luxury and functionality with outstanding performance. At 24 meters, the new MCY 80 takes its place on the podium as the third largest yacht in the collection and delivers pure cruising pleasure alongside an unparalleled ride and comfort experience. 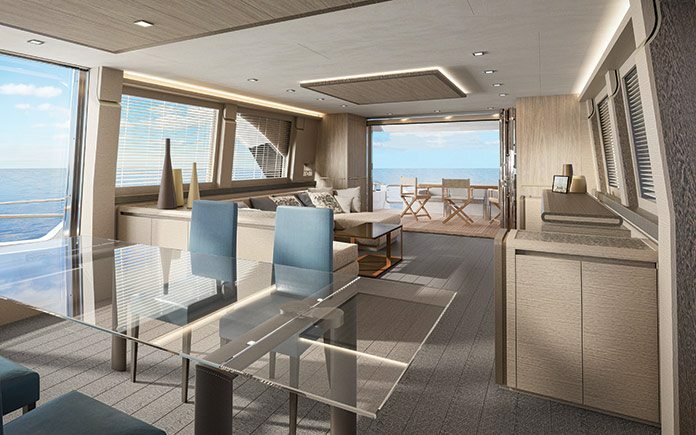 With smooth exterior lines and shaped bulwarks which enhance the level of light and space across the main deck, the MCY 80 boasts a curvy, modern look without being too sharp or minimalistic. Signature elements include a class-leading entertainment foredeck and Portuguese bridge that no other yacht in this size category can match. 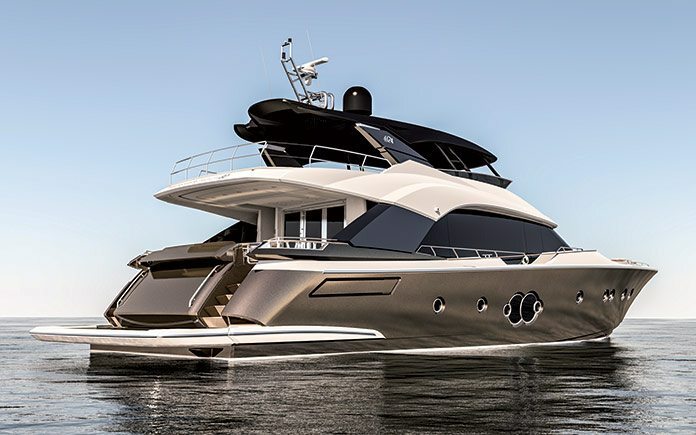 The flybridge, an iconic characteristic of the MCY range, can be equipped with a Jacuzzi, large bar area and sunbathing chaise longues to create an exterior hideaway that is as luxurious as it is intimate. 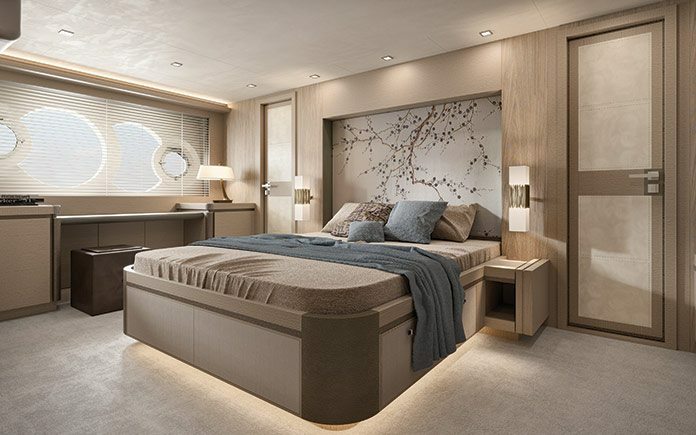 Like with the other yachts in the collection, an instant sense of spaciousness both inside and out becomes immediately apparent upon boarding the MCY 80. The main saloon and the cabins are flooded with natural light and offer lushly appointed and detailed spaces for both social and private moments. The brushed and bleached oak floorings found throughout set an elegant ambiance that is further enhanced by precious leather and stone features. Design furnishing choices such as the Hermes, Armani Casa and Minotti elements complete an interior that is effortlessly modern and tasteful. The MCY 80 is designed and built at MCY’s Monfalcone state-of-the-art shipyards, which count 18.000 square meters of covered facilities. Recently, the site has been expanded with an additional 3.000 square meters that include the new spray booth for boats over 60 meters in length.